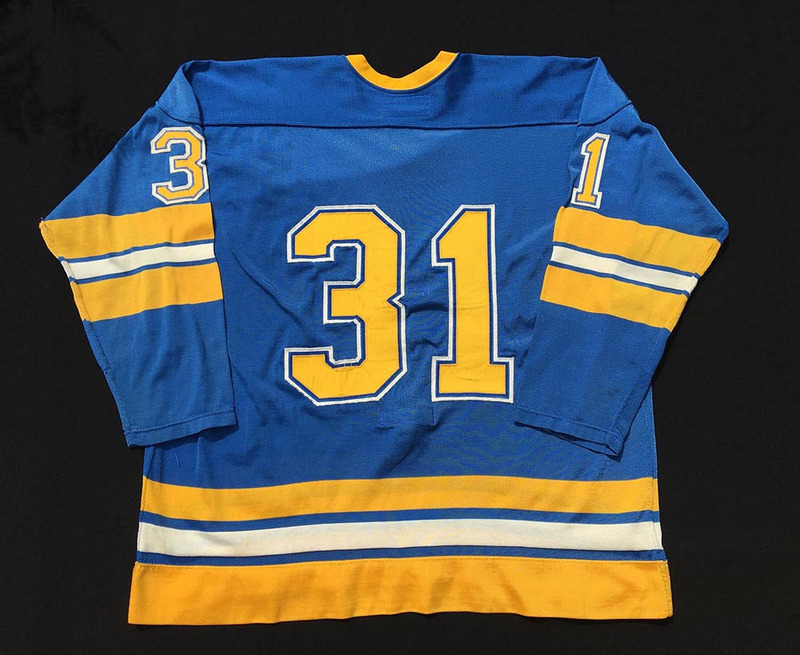 This classic size 50 Rawlings dureen jersey was worn by 1970’s and 80’s NHL goaltender, Ed Staniowski. Ed was born in Moose Jaw Saskatchewan and played with the SJHL Moose Jaw Canucks in 1970-71.Ed was drafted in round # 2, 27th overall by the NHL St. Louis Blues after winning the Canadian Major Junior Player of the Year in 1974-75 and the 1974 Memorial Cup as a member of the Regina Pats. 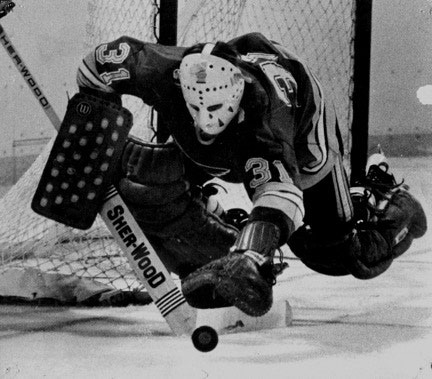 He played 11 games in his rookie year of 1975-76 with a record of 5 wins, 3 losses and 2 ties and a 3.19 GAA. Also three games in the playoffs with 1 win and two losses and a 2.04 GAA. 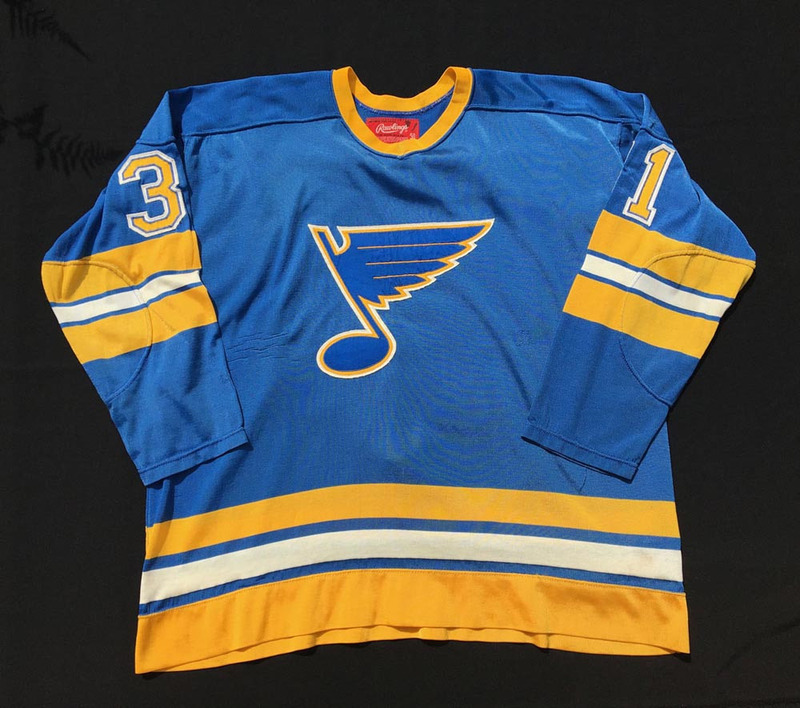 Ed played with the St. Louis Blues from 1975 to 1981 when he was traded to the Winnipeg Jets. He played parts of three seasons in Winnipeg and finished his NHL career with the Hartford Whalers. This jersey is identified as a 1975-76 with the Rawlings tag in the collar and the numbers up high on the back. The colour sequence of the hem is the yellow-white-yellow. The jersey has a few team repairs and the original loop style fight strap. Photo referenced to an image of Staniowski from the 75-76 season based on the mask he wore at the time. I am very proud to have this in the Museum collection as Ed was a goaltending coach for me in Moose Jaw in the late 70’s.